When I got hold of Frank to do the stuff around the house, I went to see a reference to find out just what I could get Frank to do and where I would need to employ someone else. I was assured that Frank could do just about anything, but that I would have to watch him “on the squares” — he has a habit of not squaring things up. Which brings us to tiling. I was (and still am) sort of worried about Frank’s tiling abilities. So I set him to tiling the bathroom floor, both square meters of it. That came out OK (but then again, it’s hard to stuff two squares of tiles up). But then it came to the kitchen / dining room / entrance floor. Firstly we (Tanya and I) decided to use spot tiles here and there (which I did not think was going to be a problem) and secondly, after a lot of thought (about Frank’s abilities, specifically) we decided to lay the tiles at 45 degrees to the walls. I explained this to Frank and could see that he didn’t *quite* get it. So I explained, explained some more, figured that the lights were going on. And they were, except that after day one it’s clear that he didn’t quite get the whole spot tile thing. So I explained some more. Showed him how to use a 45 degree mitre to draw the cut line. 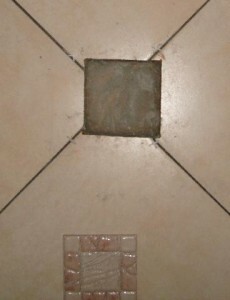 Explained that the spot tile is 110mm wide, so the cut line has to be 55 plus a bit from the tip of the big tile. Drew lines, drew pictures. And told him which tiles to rip out and redo (two of the four at left, the other two just have to be cut straight). That’s the problem with not using the professionals. I not only have to understand the job, I have to figure out how to explain the job to Frank so that he understands.